Fibromyalgia neck and shoulder pain encompasses 2 of the most commonly reported locations for chronic discomfort to occur. 10 of the anatomical diagnostic points for FMS are located within the immediate vicinity of the neck and shoulder region. 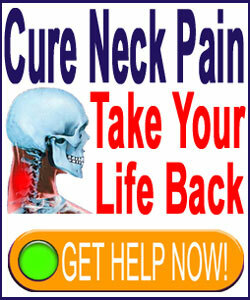 Fibromyalgia neck pain syndromes continue to grow as literally epidemic health disorders. The enigma of FMS is one of the worst failings of our modern medical system. In fact, besides for an ever-increasing rate of diagnosis, doctors have been powerless to cure or even effectively treat FMS for decades already. Fibromyalgia can involve pain in a variety of tissues, including muscles, tendons and ligaments. The symptoms are characterized as superficial in depth, easily being elicited by light palpation of the involved tissues. There is no known structural, systemic, disease-process or genetic causation for FMS to occur. In fact, there are just as many theories on the true origin of this symptomatic nightmare as there are patients suffering the daily hell of a pain-filled existence. In this essay, we call on our decades of experience in helping patients to manage FMS to explain the most universally reported complaint of combination neck and shoulder pain. 2 are located in the frontal/side neck, over where the vagus nerve is situated. 2 of the FMS diagnostic locations are located in the dorsal neck, just below the hairline, or each side of the spinal structures. 2 of the points are located on the frontal shoulder, just below the clavicle. 2 of the FMS points are located on the top of the shoulder muscles. 2 of the fibromyalgia diagnostic evaluation points are located in the uppermost back, below the cervical-thoracic juncture and above the shoulder scapulas, immediately to each side of the vertebral column. It should be mentioned that these points are also commonly reported to be painful in a majority of general back and neck pain patients, regardless of where their primary symptoms reside. In fact, Dr. John E. Sarno has been reporting virtually universal soreness in many of the same anatomical locations as FMS for decades already. His work is detailed in our section covering TMS neck pain. It should also be mentioned that many people have been labeled with the FMS diagnosis, despite not having pain in all the traditional diagnostic points. In these cases, other locations are often substituted to reach the 18 points of pain needed to officially diagnose the condition. In FMS, pain is often dull and constant, sparked by acute patterns that might be activity-related or random. 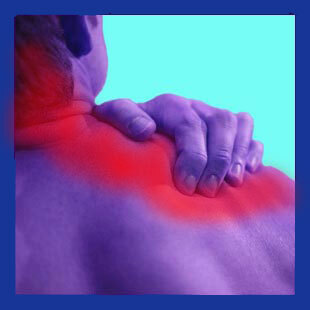 Most patients report a chronic soreness in the muscles of the neck and shoulders, as well as elsewhere in the body. This soreness is typically exacerbated by pressure, or activity, and strenuous exertions often worsen the pain dramatically. FMS continues to be a substitute diagnosis in the majority of patients who fall under its wide umbrella. This means that the condition rarely is identified as fibromyalgia upon initial evaluation, but instead, is often diagnosed as something else, possibly on multiple occasions and by multiple doctors, before the FMS verdict is finally rendered as an end-game conclusion. We see many patients who were originally labeled as suffering from the usual spinal causations, such as intervertebral herniation of the cervical spine, cervical spinal stenosis, arthritic accumulations or other backbone-related pathology. We see some patients who report soft tissue conditions being their original diagnosis, such as thoracic outlet syndrome, repetitive strain syndrome or muscular injury. FMS usually becomes a revisionary diagnosis once the pain proves to be a long-term problem that does not respond to seemingly indicated therapies. We have seen literally thousands of people labeled with FMS after undergoing one or more failed surgeries for a spinal causation that was originally deemed the source of their pain. If the first diagnosis was blatantly incorrect, why do so many of these patients hold so firmly onto the FMS diagnosis, especially when it also seems undeniably suspect from a purely scientific point of view? Additionally, what is the purpose of naming and evaluating the parameters of a pain syndrome, such as FMS, when no universally effective treatments are available? These are complicated questions that are addressed to some extent in the final section below, as well as in other writings on the subject throughout The Cure Back Pain Network. FMS is a travesty of good science and effectual medicine. Setting up diagnostic criteria yet achieving no progress towards effective treatment is so typical of the way things work in the medical sector of today. There is little logic in the diagnostic evaluation process for FMS and a span of subjective criteria used to justify diagnosis as it stands today. There is no hard science here, just excuses to label pain with some name so that treatment can progress, money can be made and patients will be placated, even though they will rarely enjoy any real or enduring relief. Our experience with FMS demonstrates striking similarities to other specific diagnoses, such as myofascial pain syndrome, tension myositis syndrome and general widespread back and neck pain. What causes one person to receive a diagnosis of FMS, compared to some other conclusions, often comes down to gender and the results of spinal imaging. If substantial structural abnormalities are discovered on imaging studies, pain will usually be blamed on these atypical tissue conditions, even when the symptoms do not support said verdict. If no significant structural aberrations exist, the diagnosis will usually focus on myofascial pain or muscle imbalance theories for men and FMS for women, based solely on gender classification and not clinical presentation. It is all quite arbitrary and terribly frustrating for patients and for us alike. We have advocated for FMS patients for decades and have been actively involved in research and treatment improvement efforts for many, many years. However, there is incredible resistance to change in the traditional rheumatology sector, despite the abysmal results offered by present forms of accepted therapy. Worse still, just as much of this resistance to change comes from diagnosed patients, as it does from caregivers. Doctors want to make the money, but what explains the patient’s need to accept the diagnosis? It is clear that many FMS sufferers would rather embrace the failed diagnosis than to seek out the true cause of their suffering. Statistics clearly show that patients with identical symptomatic presentations fare very differently depending on their attitude towards the diagnosis. Patients who accept and embrace FMS, as their true diagnosis, virtually never recover. Meanwhile, patients who question the validity of FMS, not only in their personal case, but also as valid diagnosis unto itself, have a fair chance of getting better, even and especially when no professional care is rendered. Statistics like these are incredibly frightening and speak volumes about how the nocebo effect of the FMS diagnosis is just as strong now, in medicine, in media and in the popular perception, as it ever was or ever will be.